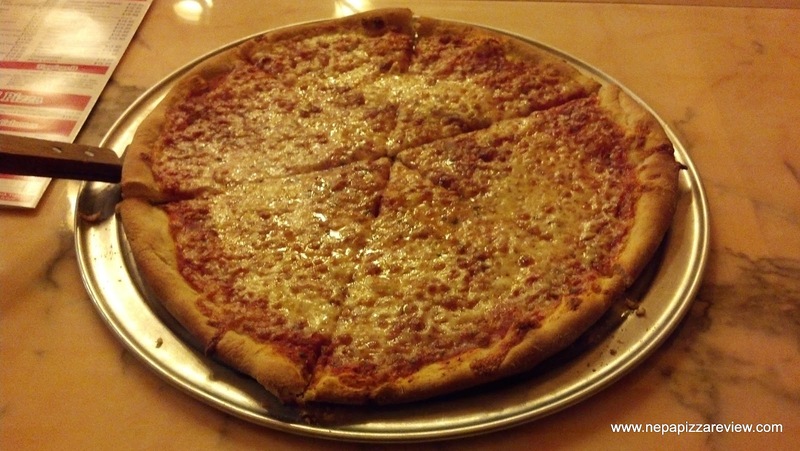 I first heard about the new Brooklyn Pizza Factory in a wonderful Scranton Times feature article by Patrice Wilding written in December of 2012. I've been anxious to arrive on the scene ever since reading that article, and finally the opportunity presented itself when I was back in the Scranton area. I suggest you read the article if you want to read an eloquent narrative on the history and background of the pizzeria. I do not want to copy any elements of Ms. Wilding's article, because I'm not a rip-off artist, nor to I have anywhere near the journalistic talents, so I will skip straight to what I do best - review the pizza! The pizza as it was delivered to me looked equisite, both prepared and cooked to perfection. 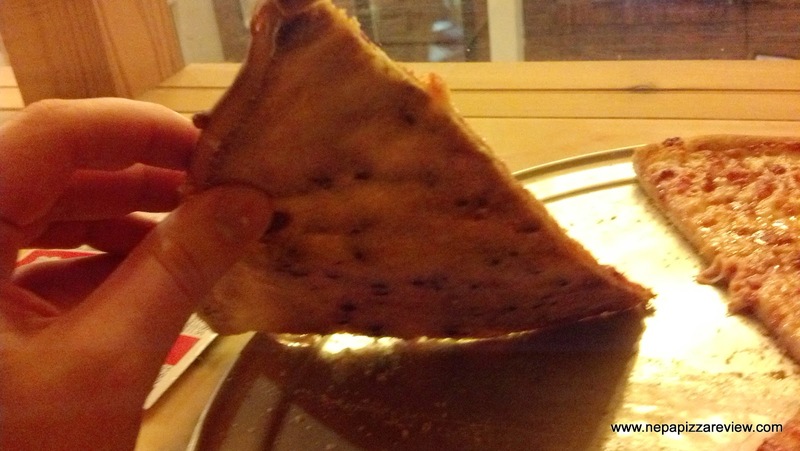 I picked up the first slice only to find that this pizza passed the "flop test" with flying colors! 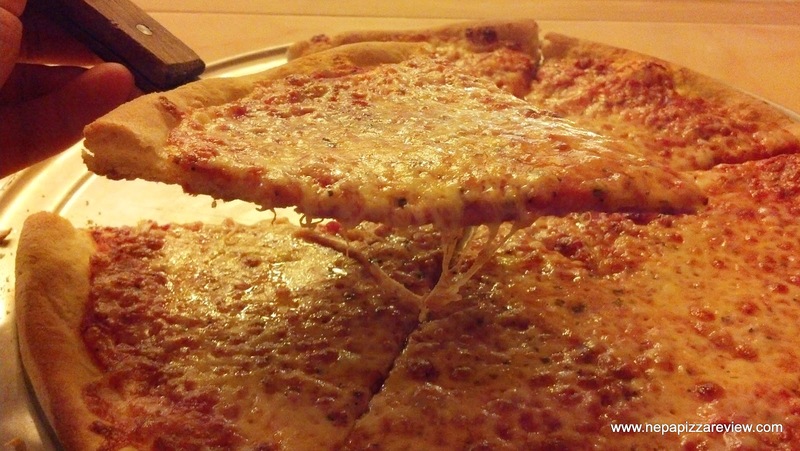 As you can see in the photo below, I picked up a slice and it supported itself without flopping down. Coincidentally, the crust was really what made this pie famous. It was paper thin, yet crispy as can be. It almost reminded me of a foldable cracker or wafer, and to me, this is what a New York style crust should be. The flavor of the crust was subtle, which paved the way for the well balanced, slightly zesty, and full-bodied sauce and the high quality mozzarella cheese. I got so excited about the authenticity of this New York pie that I introduced myself to the owner and pizza guy after I was done eating. 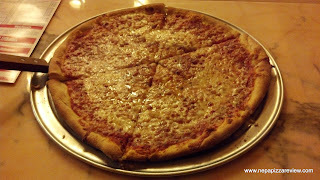 We had a lovely conversation about the business and the many gourmet offerings that Brooklyn Pizza Factory has including an "upside-down sicilian pizza with a sweet sauce" which sounded rather intriguing. It's rare for me to meet someone that matches the level of enthusiasm that I have toward pizza, but this pizza maker had a genuine passion for the craft which was refreshing. I learned a little about the famous "Brooklyn water" and how he is able to make Scranton's water even better than Brooklyn's with a few tricks of the trade. I could tell this guy would school me on a few things in the pizza world! Our conversation was brief, but eventful, and I was glad I took the time to introduce myself. I think I want to integrate this concept a little more in my future writings. Let me know what you think about that in the comment section below! 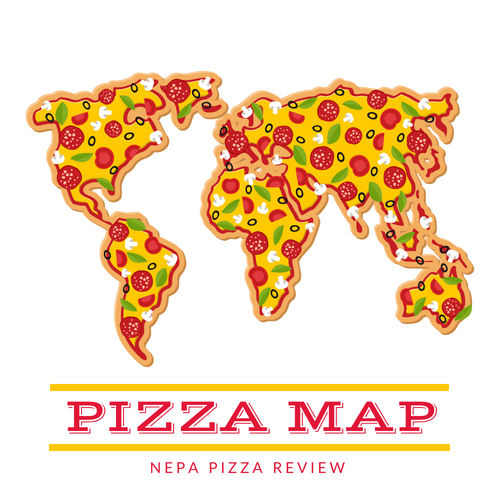 For those who have read some of my many other reviews, you know that I am a staunch supporter of NEPA pizza being the best in the world. People who bad mouth the pizza in our area are typically those who say "American Cheese don't belong on pizza" "American Cheese ain't real cheese" and "real pizza is round." Well, to those people (who are generally New Yorkers) I say, "oh yeah? we have that too and it's just as good as yours!" That's funny you should mention about the 'american cheese'. When we first moved here (Berwick) everyone told me I had to get Dalo's pizza, it was the best in town...so I got two 'trays' of it (wasn't used to that either) and actually got a slice and a half into me before I just couldn't eat anymore. Found out it was made with American cheese and my reaction too (being from Long Island) was 'what the hell is American cheese doing on pizza'. I quickly came to the realization that you tend to enjoy what you grew up with. I grew up with a different type of pizza than the people here in town, and that's fine. To each his own. But when you say 'we have that too and it's just as good as yours' I know you have never tried 'the original umberto's of New Hyde Park' on Long Island. I had a grandma pie there that almost made me cry it was so good. It was a life changing experience. The flavor was unbelievable...I was actually getting sad knowing that that eating session had to end and the last bite I took was bittersweet (emotionally, not physically tasting like that lol). That was the best pizza I've ever had in my life and if you have something up here that can match that it would be great. 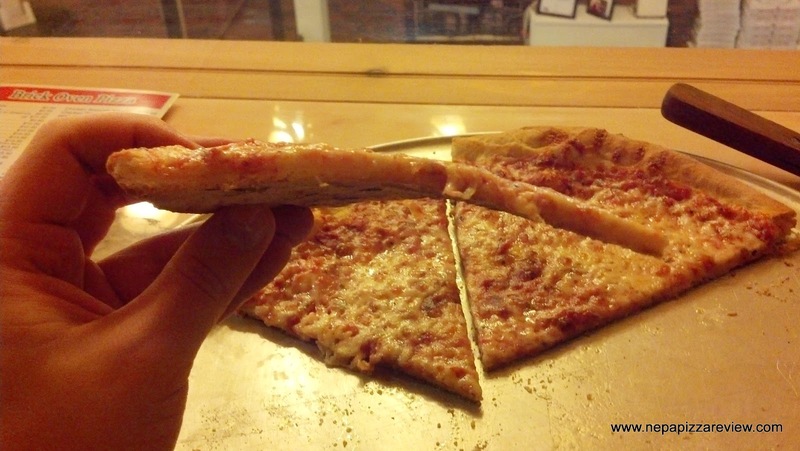 People here in NEPA love Old Forge pizzas, and you're right it's what you grow up with. I personally just love all (good) pizza. I can't say that this particular pizza was as good as the pizza you are describing, but I wish I could try that one! And no, I have not tried Umberto's, and my comment to the "New Yorkers" is really to the people who are intolerant of any pizzas other than what they had in the city and make fun of other types of pizza - especially Old Forge. There are infinite styles of pizzas, and Old Forge happens to be just one of them! There are way more far fetched pies than those with american cheese on them. Basically, I respect other's opinions on pizza even though I don't agree, so I expect the same in return. I love to hear why it is that a person loves/hates a pizza, but I don't accept "It ain't new york" or "it has american cheese" as a valid reason why a pizza is awesome or terrible. Also, I tried a grandma pizza from Rosario's in Clarks Summit which was quite good. I know it's a far ride, but it's one of the few places that serve that style and do it well. If I'm not mistaken the Brooklyn Pizza factory owner said they served the Grandma as well. King's (mt top) serves a grandma pie that is not on their menu (I love off-menu items. I used to go to Red Lobster with people and order a cheeseburger and they'd be saying 'they sell cheeseburgers here?' lol (I do not like most seafood and my wife is allergic to shellfish)). King's grandma is very good, but not quite as good as their margherita. Still good for a change of pace.